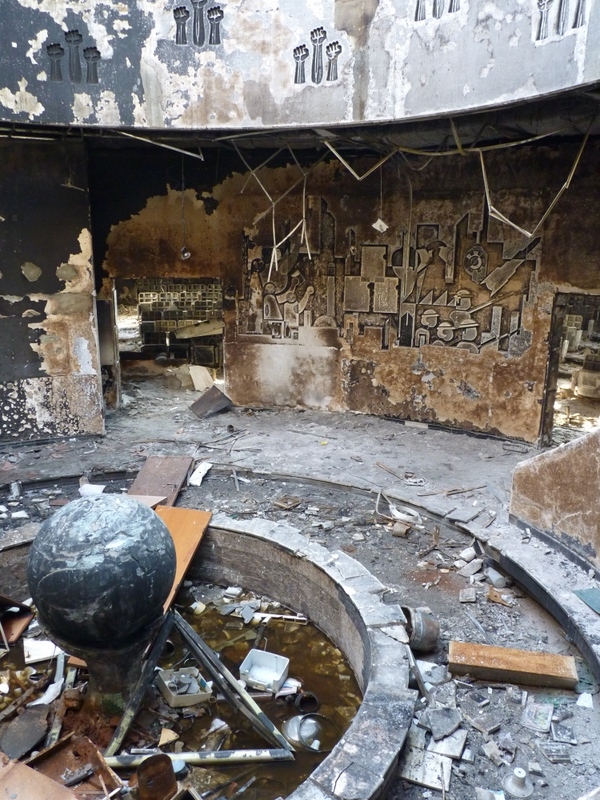 On February 17, at the beginning of the revolution, one of the first buildings that demonstrators stormed in Benghazi was the headquarters of the Revolutionary Committees. They razed it. The Revolutionary Committees (al-lijan al-thawriyah) are Gaddafi’s die-hards. Established in the 1977 as the ideological vanguard of the Green revolution, their members have a reputation as thugs who menace, beat up, and sometimes kill those who take issue with the regime. Being a Revolutionary Committee member can be lucrative, too. It is widely reported that members special benefits — such as cars and cash payments — for their dirty work. Members have also been promoted to senior government posts, in recognition of their loyalty to the Colonel. When you see footage of Gaddafi supporters in Tripoli waving green flags with gusto and holding Gaddafi’s portrait aloft, many of those you see are probably Revolutionary Committee members. 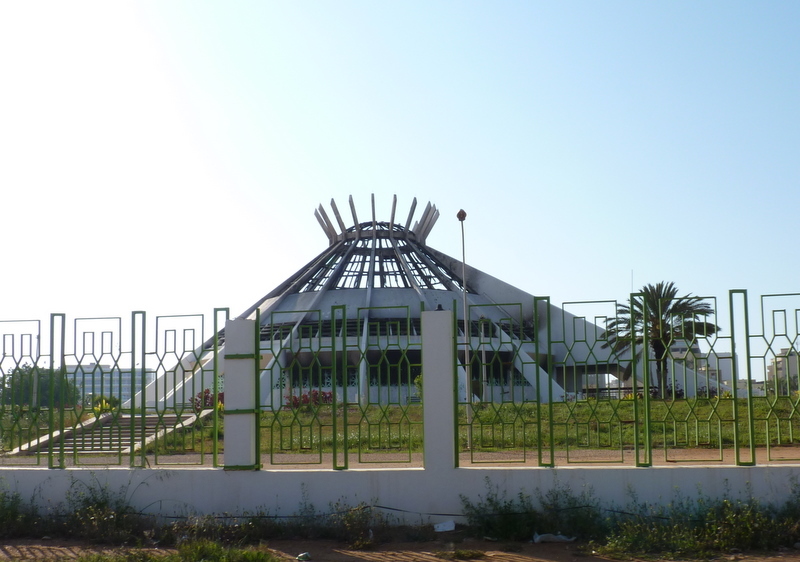 Their Benghazi headquarters looks like an outsized high-modernist tepee. A fence in green trim surrounds it. 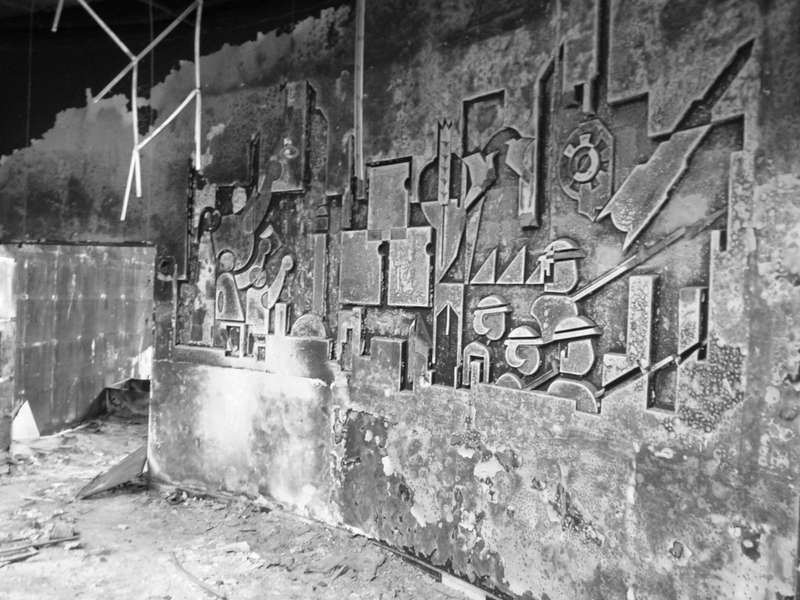 Inside its burnt remains, there is a mural that reflects some of the ideological affinities between Gaddafi’s Third Universal Theory and communism. There are heroic laborers, rockets, and lots of right angles. It wouldn’t look out of place in Minsk. A few other people are walking through the building, poking around. “Is this your first time in this building?” I ask a man in a black faux-leather jacket, probably in his late 20s. He seems a little nervous talking about it. I imagine how it must feel being in the burnt-out headquarters of an institution whose name has been associated with fear for as long as you can remember. I talk to another man, in his early 30s. It’s his first time here too. “You know, the Revolutionary Committee members — they’re not the kind of people you’d want to associate with. If someone introduced me to a friend and said he was a Revolutionary Committee member, I’d stay away from the guy.” He shakes an imaginary hand as if only decorum demands it, and then feigns walking away. Fear of die-hards dies hard. At the center of the giant tepee is a globe. 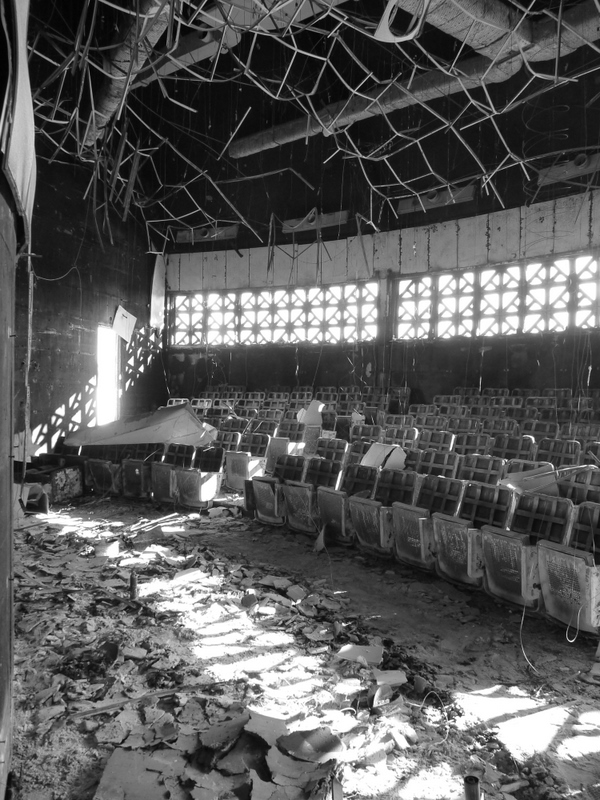 To one side is a small auditorium that seats around 100 people. Burnt pieces of ceiling dangle like a torn spider web. "Down with Gaddafi, the Green Book, and the Revolutionary Committees"
I wonder what kind of speeches neophyte Revolutionary Committee members had to listen to here. Marathon sessions in Green Book ideology, perhaps. I bet they were boring. 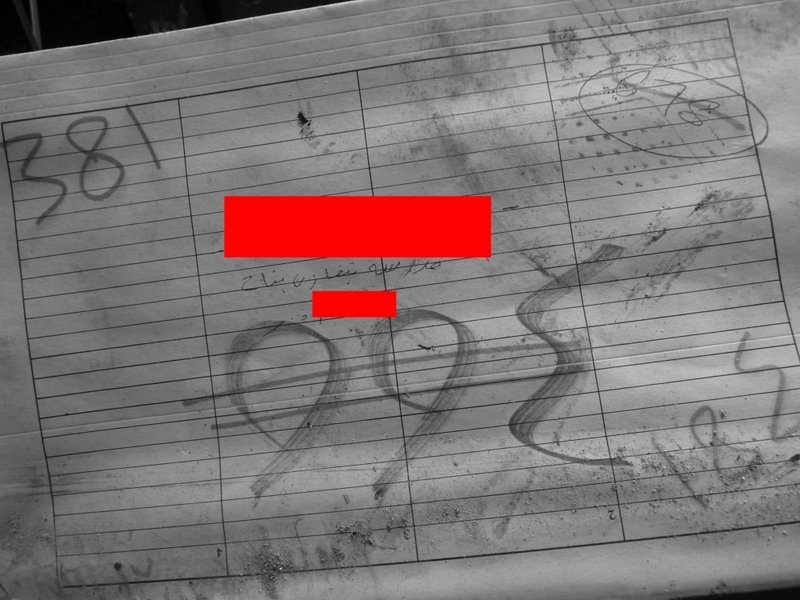 *I have changed the woman’s identity and number here, just as I have changed the identities of every Libyan in this blog who is not a well-known public figure. “These are the files that the Revolutionary Committees kept on the people they were monitoring,” says my friend. But Fatimah’s folder is empty — the papers that were once inside have fallen out. The youth who stormed this building tossed the place. This one is a membership dossier for the Revolutionary Committees. It’s got two passport-size photos still paper-clipped to the front, showing a bored-looking guy with an ample mustache. It lists his name, tribe, date of birth, and other personal information. Benghazi shook itself free of Gaddafi’s grip between February 17 and February 20. The security bulwarks of the ancien régime — the police headquarters, Internal Security headquarters, the Revolutionary Committees headquarters — were taken over or destroyed. Some of the troops stationed in Benghazi switched sides or surrendered. But others didn’t. 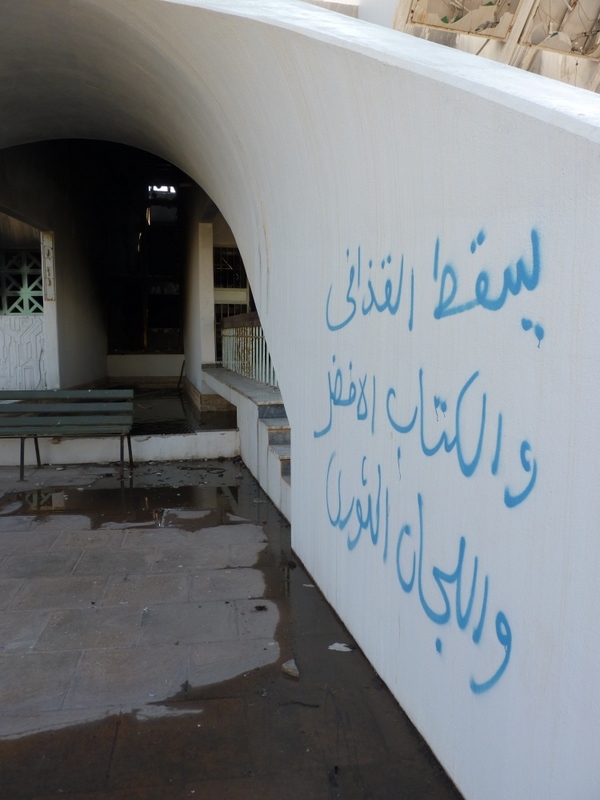 After a pitched battle on February 20 to break through its walls, Benghazi’s youth stormed the Katibah — the headquarters of the main Gaddafi militia stationed in Benghazi. A few leading regime officials, including Muammar Gaddafi’s son Sa’adi, narrowly escaped. Benghazi was in opposition hands. The same drama had also played out across Cyrenaica, in Tubruq, Derna, Al-Bayda, and other cities. By February 21, Libya’s east was free. Shortly thereafter, opposition leaders in the east announced that all Revolutionary Committee members had one week to turn themselves in, along with any weapons they possessed. If they didn’t, they were subject to imprisonment, or worse — especially if they were found with weapons on their persons or in their homes. But by mid-March, Gaddafi’s militias had regrouped and his tanks had rumbled back to the outskirts of Benghazi. On March 19, Revolutionary Committee members emerged again from within the city. As Gaddafi’s tanks closed in from the outside, the die-hards on the inside prepared to take it back. Gunfights broke out throughout the city. One 27-year-old who was manning a rebel inspection post in Benghazi describes what happened then, around March 20. He and some other rebels were checking all cars for weapons. One car came through with two men in it. When the rebels looked in the trunk, they found a pile of Kalashnikovs. The rebels figured these were almost definitely Revolutionary Committee members. If not, they had to be Gaddafi stalwarts from other organs of the regime. They contacted the opposition’s central authorities, and the two men were led away. The rebels — with vital support from Coalition air strikes — drove Gaddafi’s militias away from Benghazi and pacified the city after several days of street fighting. The few remaining Revolutionary Committee members — those who hadn’t yet surrendered or been killed — melted away again. So it’s not hard to understand why people seem a little paranoid about the Revolutionary Committees. People still tell me to be careful about the cars I get a ride with at night, or the alleys I walk down. It’s like there are ghosts and goblins about. But when you’ve lived through decades of fear and silent monitoring, not to mention two bouts of bloodletting in the space of a month, paranoia isn’t so paranoid. I glance at Bored Mustache Guy’s membership dossier again. I wonder if he’s one of those who surrendered. I wonder how his life would change if his dossier were posted on the internet. Anyone could do that, after all. Anyone can walk in here and find files like his on the ground. Benghazi’s residents seem determined to move toward a peaceful future without Gaddafi — a future without the Revolutionary Committees. But coming to terms with the ghosts of the past won’t be easy. Especially when the ghosts remain among you. Hey Ryan – This is Tom Ellison from CLS in Oman. I just stumbled across this blog from the FP article. I thought “Wait a second…Ryan…Berkeley…Islamic finance…Could it be?” I’m reading through from the beginning, you’re doing an incredible job. Just wanted to say that the information you’re putting out is fantastic. Keep it up and stay safe. Tom — Thanks a lot for the kind words. And it’s great to hear from you! Where are you these days? The revolutionary committee didn’t just work within Libya, they bothered opposition members abroad too, which is why most Libyans that have lived abroad lived in small not so famous cities. We personally chose Waterloo, Ontario and then moved to Al Ain, UAE. Great Article, i always wanted to know what was inside that building everytime i passed by. There is a building just like that in Misrata. I remember as a kid, I used to think the shape was really cool. Your article reminded me of the propaganda we were taught in Libyan public schools, we had a subject where we were taught about Gadaffi’s ‘revolution’ and the Green Book, every morning we had to swear by God to protect and spread the message of Gadaffi, I always felt guilty, swearing to God (who I loved and respected) to protect what I knew was BS, so my cousin taught me a trick, and she taught me to say “yuksem billah” (he swears) instead of saying “uksem billah” I swear. After college I did a Fulbright in Jordan, and since about August have been working in DC. Going to grad school here next fall so I should be in DC for the next few years, but looking to get back to the Mid East at some point during that time. The Revolutionary Committees were tools of Gaddafi and have nothing to do with genuine workers democracy that marxist support. Gaddafi himself was an anticommunist and I hate to see those stalinists who supported him during the civil war. The Libyan Arab Jamahiriya was a lie and the youth who destroyed the Revolutionary Committees knew it. Those members of the Revolutionary Committees were not freely elected. They were the nomeklatura of Gaddafi and his rich sons. But now Libya needs genuine socialism. Because the political parties of capitalism are ready. They will privatise the oil industrie and turn Libyan workers into slaves of capitalists and imperialists. 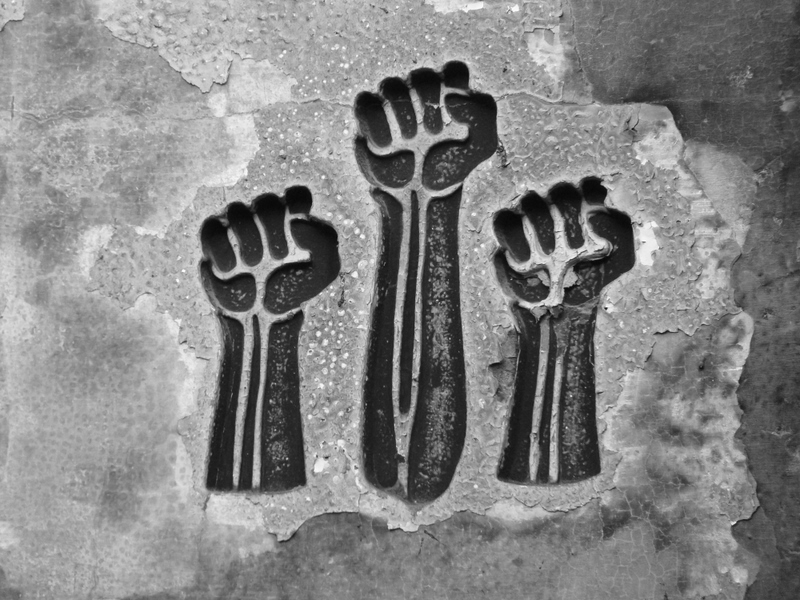 The Libyan revolution is not death, the real class struggle begins. Capitalism is the enemy of Libyan youth and workers. Soon they will find out of Gaddafi former friends in Europe are!